The medulla oblongata is a structure in the brain that transfers nerve messages from the brain to the spinal cord. In addition to connecting sensory and motor messages, it is responsible for many vital involuntary functions including regulating blood pressure, adjusting your heart function, pacing your rate of breathing and coordinating swallowing. The medulla oblongata, also known simply as the medulla, is located at the back and the lower region of the brain, connected to the spinal cord. The area where the medulla oblongata is located is commonly known as the brainstem. 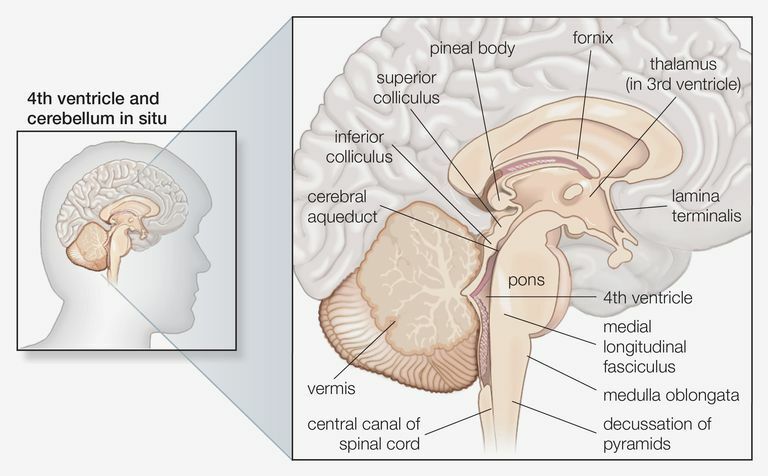 The brainstem is composed of 3 sections: the upper part is called the midbrain, the middle part is the pons and the lower part of the brainstem is the medulla. The medulla is located above the spinal cord and below the pons. A stroke of the medulla oblongata interferes with vital nerve messages and can result in a number of serious problems, such as paralysis on one or both sides of the body, double vision and coordination problems. A stroke involving the medulla can also interfere with your body's normal breathing and heart function. Some people with a medullary stroke may require the use of a machine for breathing. More severe strokes in the medulla oblongata can cause "locked-in syndrome", a condition in which people are conscious and cannot move any part of the body except their eyes. Stroke symptoms can be hard to recognize. Stroke of the brainstem and medulla may initially cause vague symptoms, such as headaches and dizziness. But the symptoms can worsen and the stroke may progress rapidly. Among the unique features of a medullary stroke is that it causes numbness and sensory problems on one side of the body, and weakness on the opposite side. This is unusual because most other strokes cause sensory problems and weakness on the same side of the body. There are long nerve pathways that transmit information between the body and the brain- and because many of these pathways cross over to the opposite side in the medulla- this unique pattern of symptoms is characteristic of medullary stroke. In rare cases, an injury to an artery due to sudden head or neck movements may be a factor. This stroke survivor shares her story of the sudden injury that caused her stroke. A stroke in the medulla oblongata can be more difficult to diagnose than other strokes due to vague symptoms, such as dizziness, balance problems, and headaches. Usually, a neurologist can identify a medullary stroke during a physical examination, but if the symptoms are mild, then it might not be very apparent in the early stages. Diagnostic testing includes imaging studies such as a brain CT scan or a brain MRI. In general, a brain MRI is usually considered a reliable test for identifying strokes and other abnormalities in this region of the brain. If there is concern about the blood vessels or blood flow, sometimes an ultrasound or angiogram can help with observing the blood vessels. If you have had a medullary stroke, your recovery depends on the size of your stroke and how quickly you were treated, as well as your own rate of healing. Strokes of the medulla oblongata do not affect the language or thinking areas of the brain, and this can make it easier for you to participate more fully in your rehabilitation therapy. Medullary strokes and other brainstem strokes are among the most difficult to recognize and diagnose. This can delay your treatment, which may be frustrating for you and your loved ones. The outcome of a medullary stroke can vary- as it is a small region of the brain with many vital functions. Clinical Stroke Syndromes, Kim JS, Caplan LR, Front Neurol Neurosci. 2016;40:72-92. Epub 2016 Dec 2.